TAKE LOUNGING TO THE NEXT LEVEL WITH A COMPLETE CONTEMPORARY LANDSCAPE The LOU lounge system by Toan Nguyen represents both a return to DEDON’s roots and major step forward. Nguyen, a master of modular design, has created a collection so casual, friendly and inviting that one almost fails to notice the architectonic rigor that underlies it. Combining traditional DEDON craftsmanship with innovations in cushions, weave and material mix, LOU takes outdoor lounging to a whole new level. The collection was conceived from the ground up as a series of overlapping horizontal strata, with armrests defined by a subtle relief in the woven structure of the seat. Thanks to a semi-open weave and hidden gliders underneath the modules, the overall design gives an impression of extraordinary lightness, as if the collection consisted of a series of low floating blocks. With its wide range of modules, LOU can be configured for any outdoor setting, no matter how large. A curved module — DEDON’s very first — brings a special twist to the otherwise rectilinear design, allowing for bent, snaking or semi-circular arrangements. aWhen viewed from behind, the curved modules create a landscape-like effect, the curved backsides conveying a protective sense of enclosure. DEDON and Nguyen researched heavily into foam materials in order to develop LOU’s easy-care, weather-resistant, reversible cushions. Remarkably thin yet incredibly comfortable, the cushions can be quickly picked up and carried inside in case of a sudden shower. During the off-season, their thin shape makes them particularly easy to stack and store. Created from three different profiles of DEDON Fiber in three different shades of gray, LOU’s seemingly random, semi-open weaving pattern has the the look of a light woven textile. When combined with the wide range of material finishes of the LOU tables and accessories, this textile effect helps users to create sophisticated ‘total’ atmospheres. 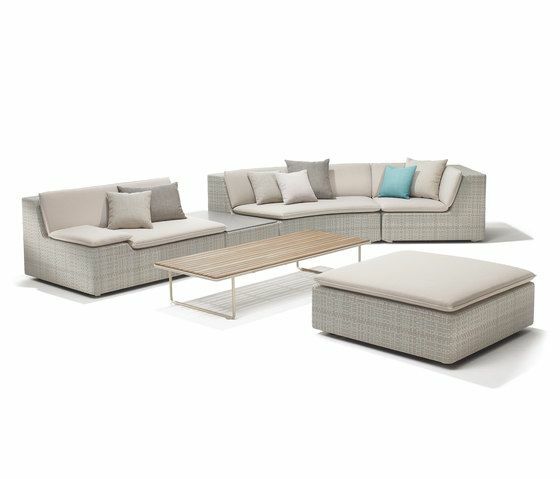 In addition to the modules themselves, LOU includes teak arm trays (which can replace or be combined with arm cushions), rich ceramic tabletops for the footstool modules, a coffee table with solid teak slats for the top, and a powder-coated stainless steel side table thats slides under and overlaps the modules. When all of these elements come together, the results is an outdoor modular system like none before it. At the end of the `80's, former professional Bayern Munich footballer, Bobby Dekeyser, decided to develop high quality outdoor furniture that could stand up to wind and weather.